I know fall is quickly approaching, but I refuse to accept it quite yet. Even though the sun is setting at 7:30 pm and the cool evening temperatures are arriving, I’m not ready for summer to come to an end. Instead, I’ve been reflecting back on this summer’s festivities and trying to make the most of the warm days remaining. From June Birthday parties and another successful Ashley Abrahamson Memorial Tournament, to a 10 year class reunion and numerous bike outings and trips to the lake, this summer has been very busy, but very memorable. My husband and I also had a numerous of “firsts” together. We went kayaking on Lake Calhoun, attended the State Fair, played golf and mini-golf, attended the horse races at Canterbury (and won $25! ), and enjoyed a ride in my parent’s new convertible. In addition to the warm weather and ability to spend time outdoors, one of my favorite things to do in the summer is grill and eat dinner outside. We’ve been taking advantage of our beautiful terrace at our apartment as much as possible. 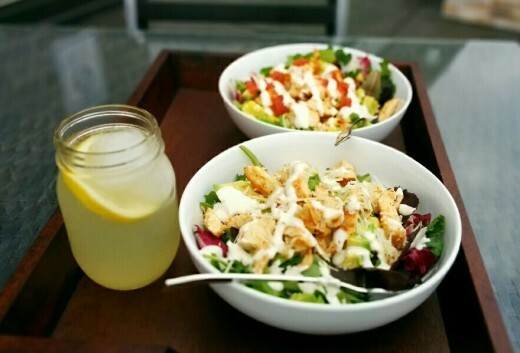 Not only is a great place to enjoy a summer meal with some fresh lemonade (or a glass of Kim Crawford Sauvignon Blanc! 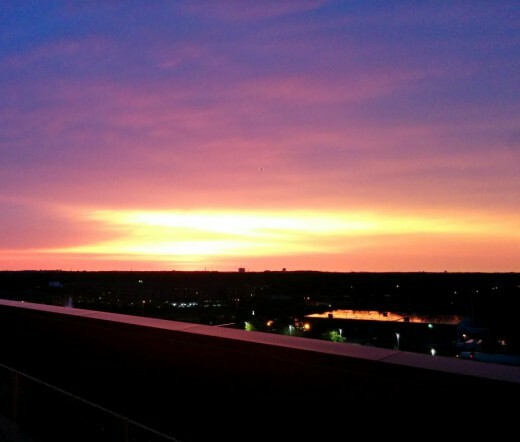 ), but the views of the city and sunsets are beautiful. 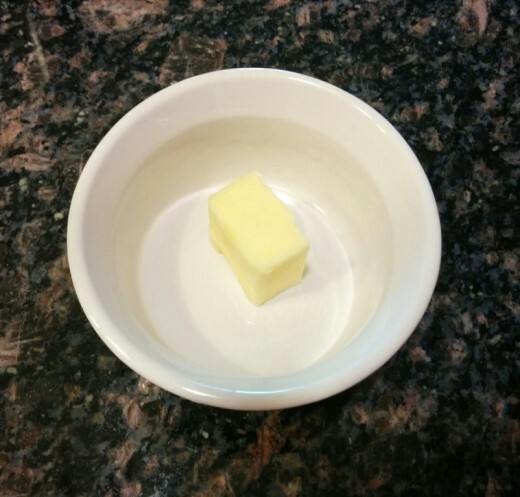 Since we’ve been doing a lot of grilling, I’m always trying to come up with new recipes to try. We tend to make a lot of grilled chicken and vegetables, but we branch out and make burgers and steak every once in a while. I don’t make dessert too often, but like to do it every one in a while for a treat. When we received peaches in our CSA, I immediately thought of grilled peaches for a healthy dessert (well healthy before I add the whipped cream or ice cream :)). Not only is this recipe a great way to end a summer meal, but it’s one that can be enjoyed as we inch further into fall. To begin, wash and dry the peaches, then slice each one in half along its length. Remove the pits. 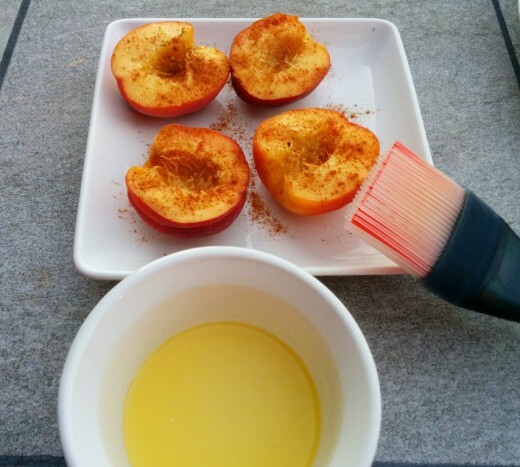 Divide 1/2 teaspoon cinnamon between the peaches and lightly sprinkle it on each peach half. 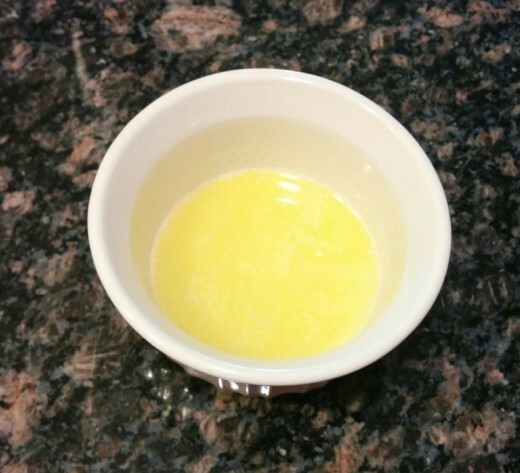 In a small ramekin, melt 1 to 2 tablespoons of butter. 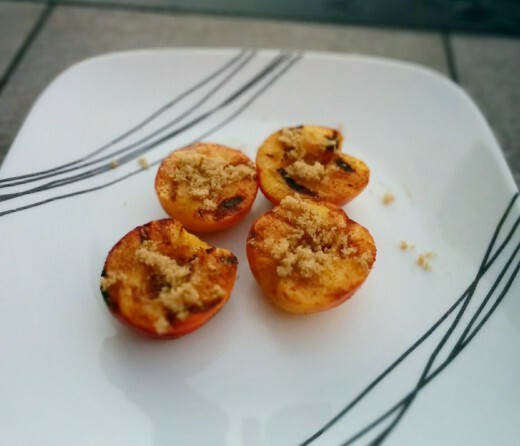 Brush the melted butter onto each peach half. Place face down on the grill. Grill at about 350°F-375°F for 4 to 5 minutes, until the peaches are warm and nicely browned. Remove from the grill. 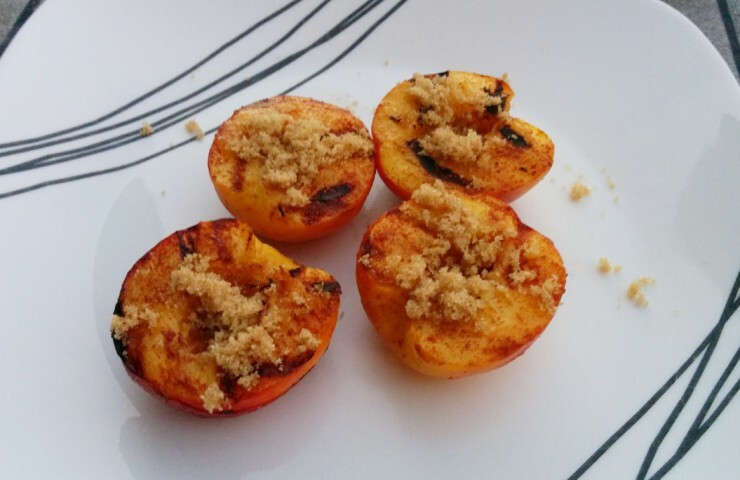 Divide the brown sugar between the peaches and immediately sprinkle it on each peach half. 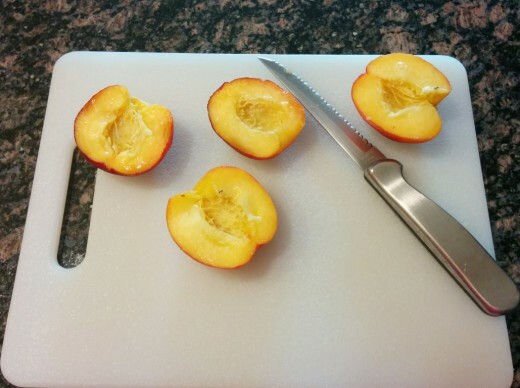 Sliced each peach in half and remove the pit. 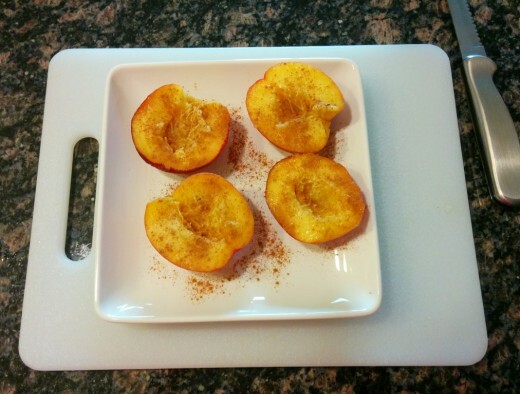 Divide cinnamon evenly between the peaches and sprinkle over each half of the peach. 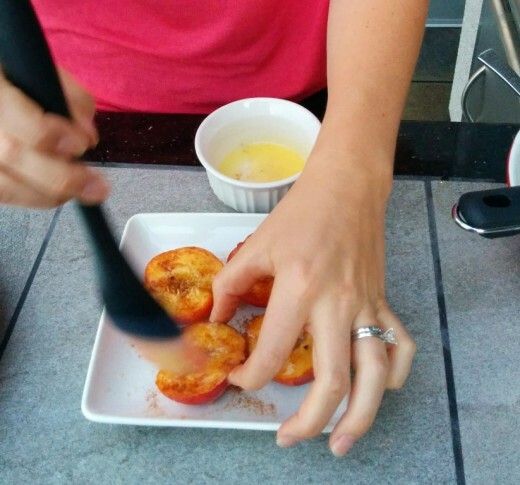 Melt butter in a small ramekin then brush on each inside face of the peach. Heat the grill to a medium heat (about 350°F-375°F). 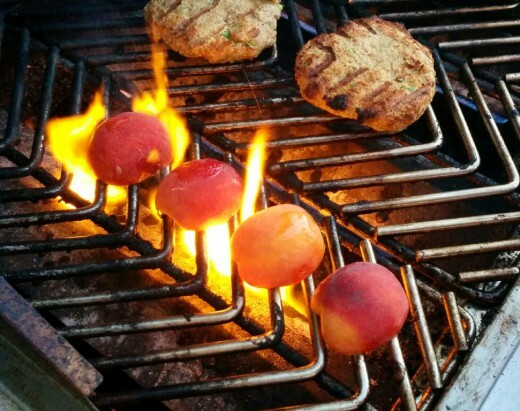 Place each peach half face down (buttered side) on the grill. Grill for 4-5 minutes, until the peaches are warm and the face is nicely browned. 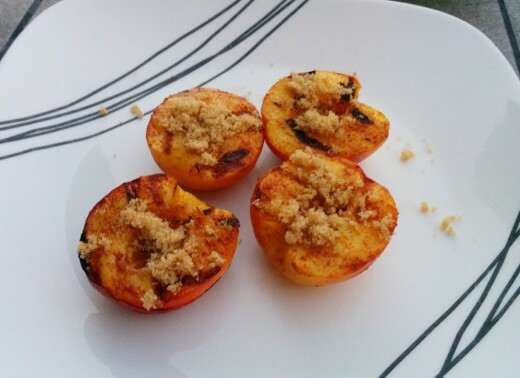 Divide brown sugar between peaches and sprinkle on each peach half. Serve with ice cream or homemade whipped cream.